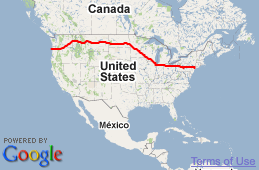 ← Continental Divide, here I come! Make that 4 moms! Be VERY careful and the drivers can’t see you around those corners until they’re on top of you. Good luck and be safe! Make that this “mom” as well! No I am not your mother…..
Did you…pull your cell out then? In California it’s illegal to drive while using a cell phone. Is it that way in Montana too? I hope for Matt that their cell phone use laws don’t apply to walking with converted baby joggers. Not illegal, just not recommended on these winding mountain roads…thus the sign. I’m not sure if Montana has passed a ‘no phoning while driving law’ yet. I saw one of these signs on another Montana State Hwy not too far from Matt’s location just last Monday while heading back to Idaho from a motorcycle trip through Glacier N.P. Even if no law, it’s a great idea to remind people of the danger with these signs and pull outs. It appears as if the people of Montana are free to talk and text while driving. Tsk, tsk, tsk. So are you going to pull the ol’ cart over and use the cell phone? And then pull out? No wheelies now with that cart of yours and no peel outs either. Glad to see they have areas like this and that the cell works out there. Yes, Matt, be careful out there. Drivers are not going to be expecting to see someone walking along the side of the road, and there’s not much shoulder. I hope you found some slightly flatter spots along the way, and didn’t have to climb up or down the side of the road to make camp. Might also be a area where driver can get cell phone reception. There might be a signal on top of a mountain than goes away in a valley. Birth control suggestion for cell phones? I look forward to more pictures of this awesome scenery! Thanks Matt! Sorry but I do not get the whole cell phone and texting thing while driving. If hands free phone OK but texting is in my mind just as bad as drunk driving. Distractions of any kind are dangerous while driving. Seeing these down hills reminds me that your knees really take a beating on down hills. When hiking I always dread downhills more because of how it make my knees hurt. Of course you are half my age so that might have something to do with the pain. Also, I have put many miles on my knees over the years running, walking and hiking. 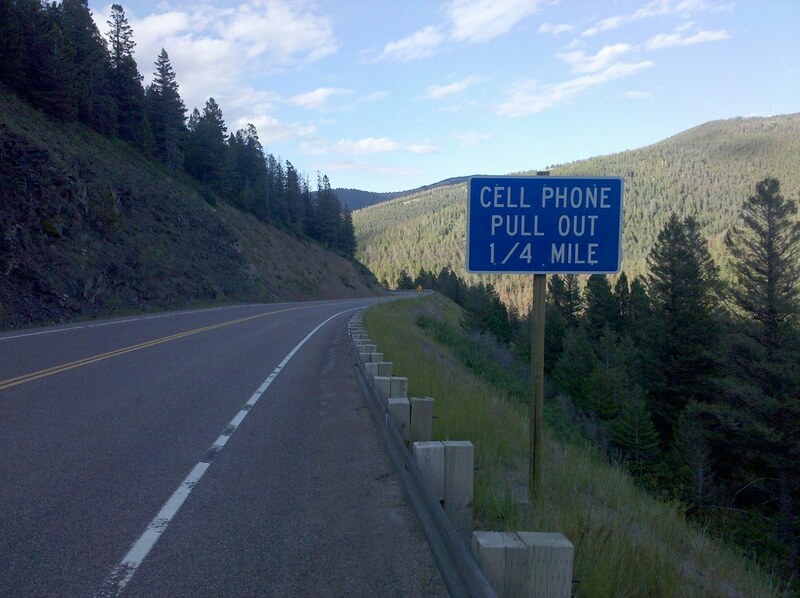 hey… could someone clarify what the sign means, is it an area that you can pull into, stop and make a phone call? I have little else to worry about so this is driving me nuts. Chrsi, don’t go nuts yet. There’s no signal when you are going thru the canyons until you get to the top of the mountain where there is a transmitter to receive service. You also have to pull out as there is more up and down and around the mountains until you get to a flat spot again. We don’t have a cell phone law yet, but lot’s of flashing signs on the freeways to remind people to not drive and text. A lot of our backroads are narrow with small shoulders making it difficult to pull over so I hope we have a law soon, which is needed to try and keep people from talking while driving these dangerous curvy roads.